Maintaining your caravan in top touring condition is essential for safety and comfort. Our range of quality accessories and replacement parts will keep you secure and legal on the road wherever you find yourself on holiday. 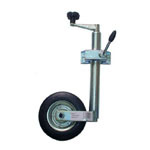 Damaged, seized or just showing its age, we offer geared and sliding post wheels to suit a range of caravans and trailers. 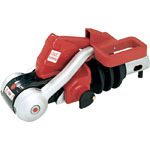 Don’t wrestle with parking and hitching; keep your jockey wheel in top condition for effortless manoeuvrability. Our range of AL-KO stabilisers are critically acclaimed and recognised as the best way to improve driving dynamics and stability of your combination, even under sustained European touring speeds and strong crosswinds. For larger caravans and trailers these are an essential fitment. AL-KO stabilisers offer full anti-snake control, install ATC equipment for smart, active stability assistance before driver intervention. For twin sockets (7N or European 13-pin) we have a range of solutions for your wiring needs alongside towballs for popular mounts and applications. Adapting from 12-pin single or dual sockets is usually straightforward, but if your factory fit option is well installed we also offer adaptor cables. See and pre-empt the actions of other road users with approved towing mirrors, extending the view from your vehicle to encompass blind spots and the width of your caravan or trailer. Relying on small mirrors designed for manufacturers’ aerodynamic and styling needs can result in inadequate rear visibility and nasty surprises. To comply with current legislation any vehicle towing must be able to see 20 meters behind and 4 meters’ either side. 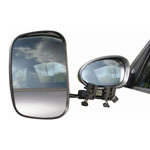 Mirrors used on vehicles registered from January 2010 onwards must also use mirrors E-marked to indicate compliance with EEC regulation 2003/97. Towing without the required mirrors can invalidate insurance. Replacing or upgrading, we offer conventional and LED clusters to suit all applications and budgets. 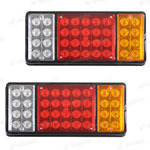 Older caravans and trailers can be obscured in the glaze of super-bright lights from modern vehicles, and upgrading to LED will not only reduce time between installing replacement bulbs, the brighter light and faster reaction will ensure your caravan is seen in plenty of time by other road users. Upgraded side markers will help avoid late-night mishaps in tight spots, and power consumption is dramatically reduced, saving your alternator and batteries.